Aarggghhh! I thought I was about to post something that showed my positive, healthy connection to race relations, but then I unearthed a memory to the contrary. 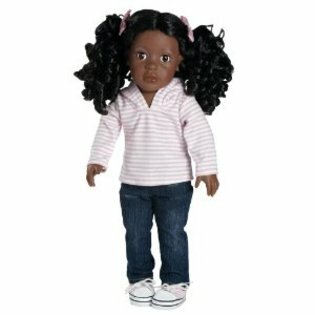 My mother used to buy my cousin Samantha black dolls for her birthday. This was a memory I conjured up when I pondered the source of my obsession with race relations. I figured it had to come from somewhere, so I looked back at how my parents’ values, life lessons and actions helped to shape me. I was all set to tell the story about my Mom and the black dolls, but then another memory came to surface….Well, first, let me at least have this memory of my Mom and Samantha, and then I’ll tell you the other one. My younger cousin, Samantha, or Sam, is now in her late 30’s. She believes she received the dolls from my mother when she was between the ages of six and nine. “I just remember black dolls….more than once. I think it was at least twice,” Sam tells me. I wanted to know what she thought the first time she got the black doll. The comment this is so Aunt Suzie stopped me. I had to know what she meant by this. My mother passed away a little over twenty years ago. I can’t ask her to reflect back on why she gave Sam the black dolls, but luckily I remembered her telling me she thought the dolls were pretty, and that it would be good to have and appreciate dolls that are different, not just white dolls. I remembered about Samantha getting the black dolls because it was something she’d bring up from time to time as an adult. After interviewing Sam, I thought it made sense to think about the black dolls my mother gave to me. I also received at least two, but I think my mother gave them to me when I was a bit older than Sam was at the time she received hers. I don’t recall thinking it was a big deal. I still have one–a small, fabric doll with a red and blue patterned dress and lace ruffled hem, and brown Raggedy Ann-like hair. Then the other memory surfaced. I remembered a doll my mother got me from Curacao, a Dutch Caribbean island where she and my father vacationed a few times. It was one of those dolls that had a head and upper body of an, in this case, Afro-Caribbean woman, wearing a full, boldly colored skirt. When you flipped the skirt over, it was a colonial looking white woman in an oatmeal colored skirt dotted with a tiny floral pattern. The white woman wore a bonnet, and the Caribbean woman wore a headscarf. As a child, I think I saw the doll as a tourist souvenir that represented the two different kinds of people of Curacao–black, native and white. 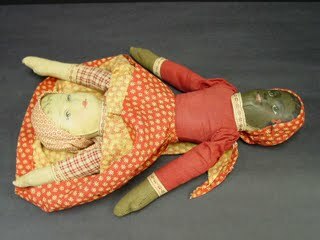 After remembering the doll, I Googled images of two-headed dolls and found out about what is known as The Topsy Turvy doll. There are two thoughts about the dolls, said to have originated in the American South, during Civil War times. One belief is that the dolls were created by an African-American woman who was a house slave. It’s said she created the doll with an African-American head on one end so that black children could have a doll that looked like them to play with. The other end had a white head so that the skirt could be turned over to display that side whenever the master was around. The other thought is that the dolls were created at that time for white children who would pretend the black doll was the maid, slave or servant, and the white doll represented either the master’s child or mistress of the house. So, do you see the dilemma here? My mother bought my cousin and I dolls that she hoped would make a positive statement about appreciating diversity, but then she also bought me a doll considered controversial for its portrayal of the black servant and the white mistress. Oy vey! All I can think of to say is, thanks, Mom, for wanting to show Sam and me that dolls with pink skin aren’t the only ones worth liking. As for the Curacao Topsy Turvy doll, I forgive you. I’ve already stuck my foot in my mouth here on this blog for being less than perfect when it comes to commenting on race. One final thing I clearly remember. I always kept the doll with the Afro-Caribbean doll side showing, because I thought she was much prettier and had a better dress on than the Dutch Colonial doll side. I enjoyed your reflection of your mother’s forward thinking with reference to exposing you and your cousin to black dolls. I am sure she meant no harm in buying the Topsy-Turvy doll for you and probably was not aware of the controversy regarding the doll. I appreciate her progressive thinking outside the box. I just wrote a blog about the Topsy-Turvy doll controversyk which is how I stumbled upon your blog. Thanks so much for reading my post about my mom and black dolls, and the topsy turvy doll. I agree with you, with time past after posting that, I realize that yes, she probably wasn’t aware of the controversy, and had just been interested in sharing a culturally diverse doll from her travels with us. I look forward to reading your post.